I want to continue this discussion of sacred space, consecrated objects, and people. The word "sacred" comes from the Latin "sacer," which means to be set something apart from the ordinary as holy, as in to consecrate, venerate, dedicate, or associate a place or time as special or sacred. Many countries, mostly ancient societies like China and India, have sacred places or sites. That is what pilgrimages are all about. I have been on pilgrimage to Tibet, China, Nepal, and India in West Bengal and Sikkim, etc., but have heard very little about making pilgrimages here in North America except to places like the Rock and Roll Hall of Fame, Elvis's home, etc. Why is that? Perhaps it is as simple as that we have never taken the time to find and consecrate those places in America that we might consider sacred. We probably don't even know where they are, but they no-doubt exist. In the U.S. we have done this with places of natural beauty, and have scores of national parks and other physical attractions, but have perhaps not had the time as a nation to yet discover those places with an inner beauty, sites that distinguish themselves from the profane as special by how they affect us spiritually. However, we can assume sacred space and places in this country do exist and are radiating whatever inner beauty they inspire while they wait to be found and known. Aside from Native American sacred sites, I don't know of many. The sacred shows itself as sacred by standing out from the ordinary, usually by transporting us beyond our everyday sense of time into a special sense of place and time. The sacred is somehow distinct from what we ordinarily know and expect. It stands apart. When something stands out to us from the surroundings (either as a person or a natural form), causing us to become aware or it of ourselves, it is sacred to the degree that we are aware if the change. It is consecrated by the experience itself. How this works is pretty easy to see in our own life. To begin with, we can become aware of what moments or places are special or sacred to us as individuals. For example, check out where you go to find peace, whether it is in the beauty of nature or just to a favorite chair or corner of the house? In other words, what have we set apart or aside as being special? What do we already consider as sacred? Sacred is as sacred does. Ultimately places are declared sacred by individuals who experience or find increased awareness or intuition in their presence and note that or point it out to others. Places are consecrated through this process of awareness, not awareness of the places so much as awareness of ourselves in these places, an important point. If we have few sacred sites here in America, this is a reflection of our own state of mind and the fact that we are just not yet aware of these locations, for such places must certainly exist. At this point in American history we may have to discover them for ourselves. Perhaps those most sensitive or aware among us will locate these sacred places in North America by experiencing themselves there, point them out, and we can travel and see for ourselves what makes it special. Does it work for us too? After all, is this not why we go to the lake or river or pond or stream, to mix our mind with whatever natural awareness we are capable of experiencing at that place and time? There is definitely a mixing of our mind with what we consider sacred going on all the time. Each of us must have people, places, or things that we experience (or have consecrated) as "special." We just have to become aware of them. Our opportunity to become aware of the sacred always comes at the borderline between the ordinary and extra-ordinary, at the threshold between these two worlds. The great writer on these matters, Mircea Eliade, used the word hierophany as the manifestation or appearance of the sacred in this profane world, what Gerard Manley Hopkins called "inscape," the way inward beyond the profane to the sacred. A whiff of the absolute always brings relief from the relative and the ordinary. We wake up. Places that can be sacred to us as a nation undoubtedly exist, but like all sacred places they must be discovered and consecrated by individuals who become aware at them. As mentioned, sacred is as sacred does, so to speak. We can easily see this in our own lives. Perhaps the place where we first meet a loved one is sacred to us by that meeting, or the house and town where one of our children is born. The "sacred," as the root of the word itself suggests, is that which is set apart from all that is not sacred, from the ordinary or profane. It stands out as an axis from which we can "see." We endlessly do this all the time, creating a personal hierarchy of what is important (and thus sacred) to each of us. These places enable awareness and self-discovery, so they are hard to miss. My point is that places of possible pilgrimage must be consecrated by those who are aware of and changed by them. Just as we flock to national parks, drawn by their natural beauty, places that invoke inner awareness must first be found, experienced, and consecrated by people like ourselves. Someone has to actually do it. Countries like India have had thousands of years to find their sacred places. Americans have yet to do it, although Native Americans certainly have. We go to their sacred places, because we have not yet found any (or many) of our own. Each of us is well on our way in this process, which we can see by just making a mental list of those places and/or rituals that we personally consider important and thus somewhat sacred to us. This could be as close as our favorite author, book, poem, or any of the visual arts that transports us, and of course movies that move us. Anything is fair game, but we must consecrate it by being aware that it is important to us by how it transforms us and treasure that. Sacredness does not go without saying. Rather, we must say it again and again and again by consecrating and re-consecrating our loved ones, families, wives and husbands, children and pets – whatever makes life worth living for us. This is what is most sacred to us. We don't have to be religious to have the sacred in our lives. Sacred is whatever we value above the ordinary. In that sense, we are all religious. Do I consider Michigan sacred? I guess I do. I know I live here, but may be unaware of all the reason why. And I know that I have little areas of nature that I like to visit that I find restful. It may not be a national park, but just a shady nook by a small stream nearby. Again, sacred is as sacred does. It is up to me to consecrate what is sacred with my awareness of what stands out. In other words, these special places wait for me to be aware of my own inner nature when I visit them. If nothing is sacred to me, it is because I am not sensitive to the awareness they offer. But even the most unaware among us has his or her favorites, those special places or objects in life that we love and where (or through which) we find peace, places we have consecrated by our own enhanced presence. And objects can be consecrated. 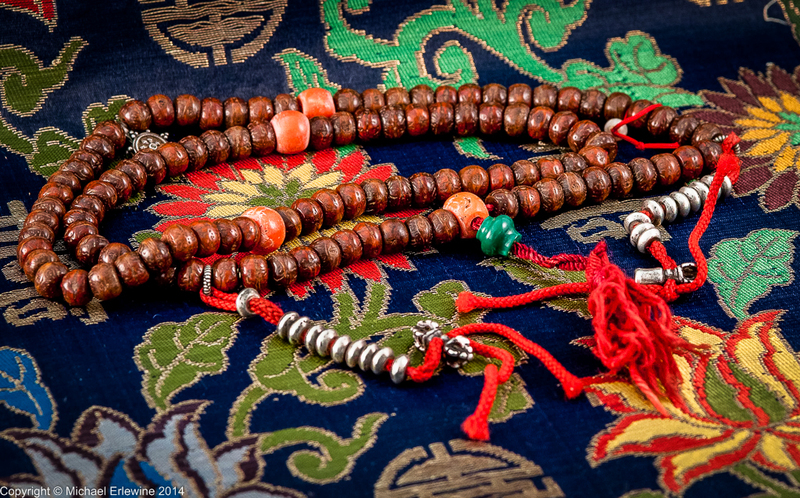 I enclose a photo of the mala (rosary) of a great rinpoche I met, who through many, many years of saying mantras has worn down these Bodhi seeds, blessing them with millions of mantras. That is consecration. But for the record, the most powerful, the most consecrated places I have ever experienced were not places but rather people, those beings consecrated by lineage and capable of causing people like myself to realize who we are, on-the-spot, so to speak. That is the most sacred space I have known, my own mind, thanks to these great teachers for pointing it out, showing me where it is.